APARTMENT WITH TERRACE AND SEA VIEW”. The concept revealed by the NC 11 realises the latest innovations in terms of organisation of space and the approach to life on board. 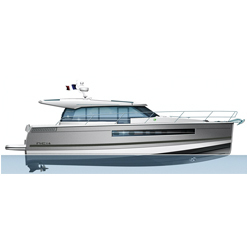 With its elegant outline and contemporary design, the NC 11 presents a new vision of the family boat, both very safe and very up to date. 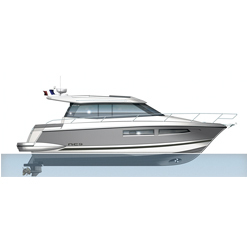 Its numerous openings and access to the outside, the ability to move around easily on board and its total adaptability make it a boat beyond comparison. Extremely comfortable, the NC 11 is a living space in which the care taken with the decoration and materials used creates a particularly warm atmosphere. Economical and suitable for all types of use (stern drive transmission chosen for power output economy), the NC 11 fully corresponds with the new “responsible” approach now being adopted by an ever-greater number of leisure boaters. What is the NC 11? It is a concept with which a very great number of owners identify.